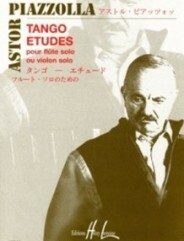 Some time in 1988, after he had returned the manuscript of the Tango-Études (or “Tangoistic studies” in the version for alto saxophone in Eb prepared in collaboration with Claude Delangle, we asked Astor Piazzolla if he could not harmonize them, echoing the requests of flautists after the original edition had been published for their instrument in 1987. In February 1989, the composer wrote to us from Punta del Este, in Uruguay, where he was staying before returning to Buenos Aires: “Dear friend, finished the piano part of the Etudes tanguistiques for saxo alto and piano… Good luck to Mr Delangle and please tell him to forgive my music handwriting. 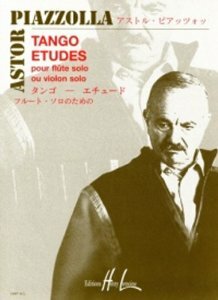 Some time in 1988, after he had returned the manuscript of the Tango-Études (or “Tangoistic studies” in the version for alto saxophone in Eb prepared in collaboration with Claude Delangle, we asked Astor Piazzolla if he could not harmonize them, echoing the requests of flautists after the original edition had been published for their instrument in 1987. In February 1989, the composer wrote to us from Punta del Este, in Uruguay, where he was staying before returning to Buenos Aires: “Dear friend, finished the piano part of the Etudes tanguistiques for saxo alto and piano… Good luck to Mr Delangle and please tell him to forgive my music handwriting. I was in a hurry and could not do il better… Please let me know if you received the music.” And indeed, the manuscript arrived just a few days later – only to be carefully stored away ! In fact it was so difficuit to decipher it that the publication had to be shelved for quite some time. In December 1989, therefore, we published the version for alto saxophone as originally planned, leaving the harmonised version to follow at a later date. But Piazzolla’s health subsequently declined, and he died in 1992. It was many years before the planned edition saw the light of day, following much painstaking work on the manuscript. (See the preface by Yann Ollivo).